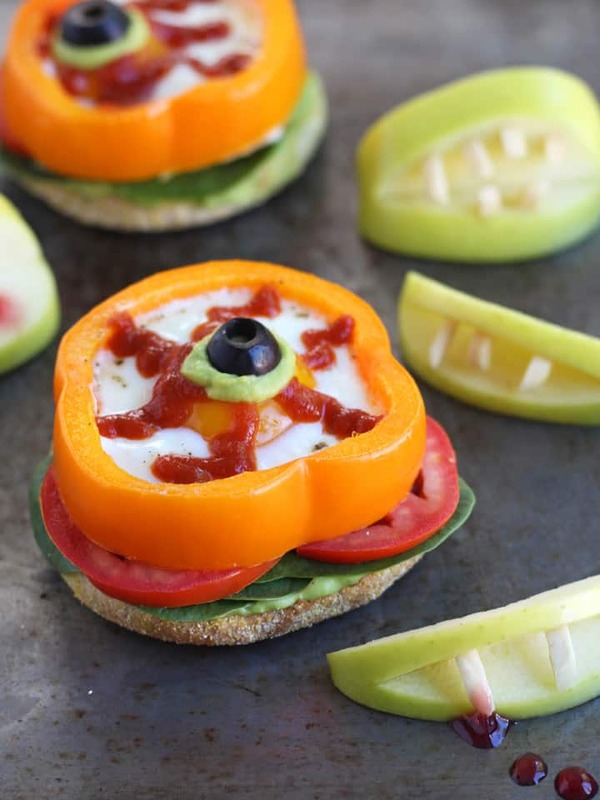 Halloween Baked Egg Eyeballs are a ghoulish breakfast perfect for kids and kids-at-heart. Serve them with a toasted whole grain English muffin, avocado, spinach, and tomatoes for a fun and healthy start to everyone’s favorite candy-filled holiday. Fact: Halloween is the best time of year. There’s so much to like: masks, candy, makeup, candy, costumes…did I mention the candy? The trick to feeling good and having fun while indulging your sweet tooth is to balance out all that sugar with a few healthier choices too. But healthy doesn’t have to mean boring, especially on Halloween. It’s the best holiday to scare up a few smiles with a spooky and wholesome breakfast of bloodshot baked egg eyeballs. They’re easy to make and with a few extra ingredients you can turn them into a filling open-faced breakfast sandwich too. Start by placing your toaster oven’s cooking rack in the middle position and preheat it to 400F. Next, slice your bell pepper into thick rings. If the peppers are evenly sliced they’ll lay flat on the bottom of the baking dish and be able to contain the eggs better. Don’t worry if they leak though – we’ve got a tip for that below! 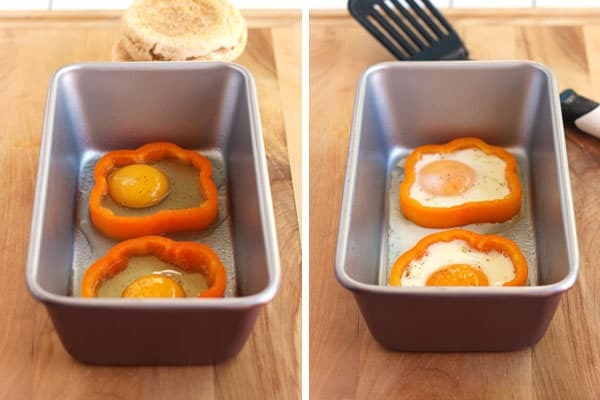 Add the bell peppers to a well-greased pan and crack an egg into the center of each one. Bake until the yolk and egg whites are cooked (no wobbles), about 10 to 12 minutes. Let the pan cool briefly. If any egg leaked out from the peppers during cooking this is a great time to cut it away (ours usually just separate from the pepper when removing it from the pan). Use ketchup, pizza sauce, or Sriracha (for the grown-ups) to draw “veins” from the yolk outward. Dollop a circle of mashed avocado on the center of the yolk. Then top the avocado with an olive slice “pupil” to finish. Related: Baked egg tostadas are great for making eyeballs with too. For a super filling breakfast, layer both halves of a toasted English muffin with the remaining mashed avocado, baby spinach leaves, tomato slices and top each one with an egg eyeball. Want to make your breakfast more fun and healthy? Throw together a batch of silly apple vampire teeth while the eggs bake! To make them, you’ll need an apple, slivered almonds and a little berry jam to drip on the “fangs.” I used the instructions for making kid-friendly Halloween apple teeth found here. 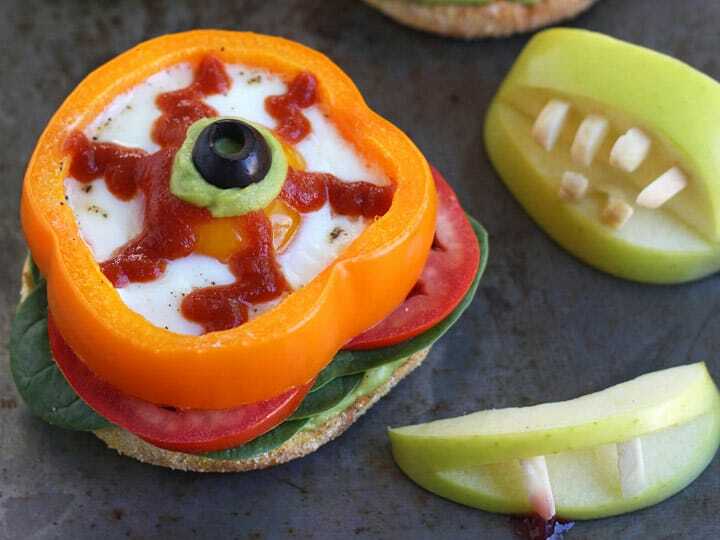 Scare up a few smiles with eggs baked in sweet bell pepper slices and turned into bloodshot eyeballs. They’re a healthy holiday breakfast that’s creepy and fun! Adjust your toaster oven’s cooking rack to the middle position and preheat it to 400 F. Generously grease the bottom of a baking dish or loaf pan. Add the bell peppers to the bottom of the pan and crack an egg into the middle of each one, then season with salt and pepper. Bake eggs at 400 F until the whites and yolk are cooked, about 10 to 12 minutes. Mash the avocado with the lemon juice, season with salt and pepper. Use the ketchup to add veins to the egg eyes by drawing squiggly lines from the yolk outward towards the bell pepper. Dollop a little of the avocado mash in the center of the yolk and top with an olive slice. Layer both halves of the English muffin with the remaining avocado, baby spinach leaves, tomato slices, and top each one with an egg eyeball. Slice large bell peppers into thick 1/2 inch rings. Slice medium bell peppers into thick 3/4 inch rings. 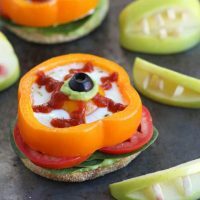 It’s better to have too much bell pepper then have your eggs spilling over and out of the rings. 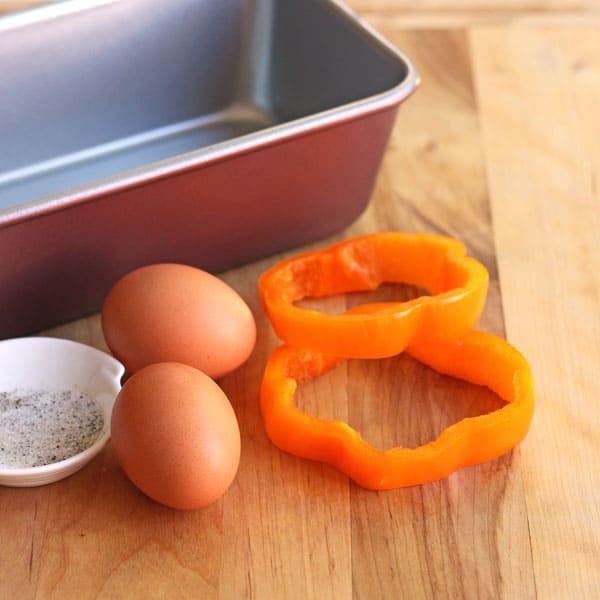 Pan Options: Use a toaster oven-safe ceramic dish, an 8 or 9-inch metal loaf pan or an 8x8 metal pan to bake the eggs. Nutritional Information is an estimate for 1 sandwich. Love these eyeball baked eggs and your idea of adding “blood” to those teeth is just perfect! Thanks, Brie!!! I love this!!! How cute for Halloween. I think I’ll make for breakfast for my kids on Saturday, they’ll love it!